The telescopes you will be building are very similar in design to the ones that were first built more than 300 years ago. Yours will have a magnification of about 25 times, which is better than most commercial grade binoculars and comparable to the best telescope Galileo built. You will see some of their limitations and, I hope, get a feel for the experimental difficulty of making the kinds of observations Galileo did. a round red plastic piece that fits over the end of the tube. The telescope Galileo used was a refracting telescope. 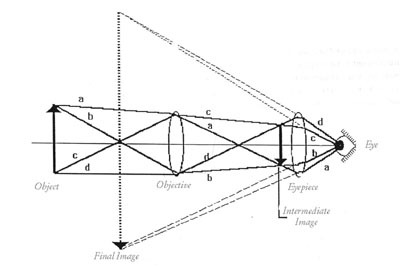 It consisted of two lenses, one converging (which causes parallel light from the sun to converge to a focal point) and one diverging (which causes parallel light to diverge from a focal point), located at the ends of a long tube as shown in the figure below. The lens closest to the object is called the objective and the lens closest to the eye is called the eyepiece. To make such a telescope for yourself start by placing the largest lens into the red plastic piece and putting the whole on the end of the large tube as the objective lens. If you look closely at the lens you may see that it is curved out (convex) on one side and flat on the other. You should place the convex side so that it points out, but the difference is slight enough that the telescope will work either way. The cardboard washer may also be put into the objective lens holder. It will restrict the field of view somewhat, but you should get a sharper image. For the eyepiece put the small tube into the foam doughnut to give it some form. The larger of the two remaining lenses is the one that Galileo would have used as his eyepiece. This lens is bowed inward (concave) on both sides (concavo-conave). You will find that it is a bit larger than the hole in the piece of foam, but that you can work it in with a bit of pulling. Be gentle so you don't rip the foam. Also try not to touch the center of the lens because the oil on your fingers will smear the image coming through lens. If you need to clean a lens, wipe it with a soft cloth or tissue paper. To view an image hold the eyepiece to your eye and move the objective tube away until you reach the length where an enlarged sharp image is seen, You will find that this distance will differ slightly from person to person due to eye strengths. It can be somewhat difficult to focus on the image of the moon so you might try focusing on a terrestrial object with fine detail which is a good distance away. The feature of the telescope constructed in this way is that the image will be right-side-up: remember Galileo initially saw the military and other terrestrial uses for the telescope where this would be significant. However, you will see that the field of view is not very large and that you might not be able to see the entire moon at once. However, you will be able to make some of the surface features such as craters. For astronomical purposes you will probably find it more satisfying to use a Keplerian telescope rather than a Galilean one. To make a Keplerian telescope you will use the smaller, concave lens in the eyepiece. This lens is the one designed to go into the foam; it fits more easily, You want to put it in so that the flat side is the side closest to your eye, and the convex side points into the tube. This telescope will not focus at the same place that the Galilean one does. You will have to adjust it differently to get a clear image. Having done so you will find that this telescope inverts the image, but at the same time gives you a larger one--it does not magnify more but it gives a larger field of view. You may be able to fit the entire moon into your field of view. In this appendix, we discuss the optical properties of these instruments to explain to you why you see the images you see. First, look at the diagram for the Galilean telescope below (The dimensions are not to scale, in particular the distance between the lenses is much larger in the telescope than in the sketch). The focal length of the objective is greater than the distance between the two lenses. This explains why the telescope is shorter in length than the Keplerian version. Because the incident rays from the top and bottom of the object never cross at the focal point, the image is seen as being upright. This is a so called virtual image because the eye receives rays as if there was an image but in reality there is no final image that can be seen on a screen. You will note when using the Keplerian telescope that the image is inverted. To explain this, look at the diagram on the next page. The first lens (the objective) will focus the object just beyond the focal point of the second lens (the eyepiece). This creates a real intermediate image. This intermediate image is now the object for the eyepiece (In astronomical use the object is at a very large distance so that the intermediate image is very close to the focus of both lenses). Because this object is within the focal point of the eyepiece the final image will appear magnified and inverted as shown. One can also see from this diagram that the field of view is significantly increased from the previous image and that the Keplerian telescope will show a much larger part of the image (not a larger magnification). The magnification of both of these instruments is the ratio of the objective focal length to the eyepiece focal length. For these telescopes the magnification is 700mm/50mm = 14X. You may also notice some slight coloring of the image around the edges. This is known as "chromatic aberration" and is due to the fact that the light refracts in the lens, and different wavelengths diffract a different amount, that is they have slightly different focal lengths. If the lens is substantially thick, some coloration will be seen. These lenses are quite thin and you should observe little or no "chromatic aberration". This effect will be studied with two prisms, in which it is enhanced and easier to study.